If you have been injured in a car accident, you may be wondering what an attorney looks for when evaluating your case. 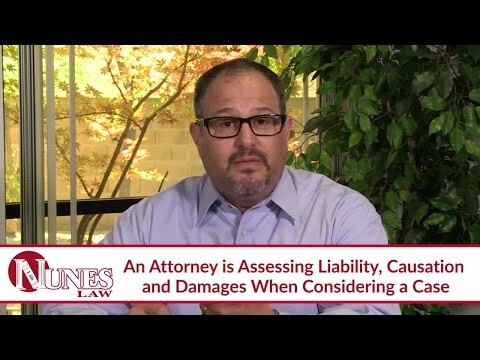 As a personal injury lawyer in California, I evaluate three key components of the case: liability, causation and damages. First, liability concerns who is legally responsible for the injuries. Evaluating causation involves considering whether the injuries were caused by the other parties’ legal responsibility. Damages sustained can include wage loss, humiliation, pain, suffering and past medical expenses. If you have additional questions regarding what an attorney looks for when evaluating a car accident case, I want you to call me at (559) 436-0850. Visit our educational website at www.NunesLaw.com, where you can view more videos and media content from our law firm.